In the gentlest way, J. Robb Brady, former editor of the Idaho Falls Post Register, corrects a statement in our front-page coverage of breaching dams on the Lower Snake River (HCN, 12/20/99: Unleashing the Snake). Paul Larmer had written that the Idaho Statesman had been the first newspaper to advocate breaching the dams. Not so, says Brady; a year before, on Nov. 20, 1996, the Post Register led the way in an editorial that concluded: "Here is a door worth opening." Since then, says Brady, a member of the Post Register's editorial board, the paper's opinion page has "endorsed breaching in a generous spate of editorials ... Pardon our pride, but I thought you should know." As associate editor Michelle Nijhuis describes in this issue, land trusts and their staffers often have to find creative ways to make ends meet. Our local trust, the Three Rivers Land Trust, is no exception. Although Robert Hayutin recently became the group's first executive director, he says he's not ready to give up his day job as HCN's prime paper mover. For the last five years, Robert has driven to Glenwood Springs, Colo., every other Tuesday, where he picks up the new issue of the paper from our printer. 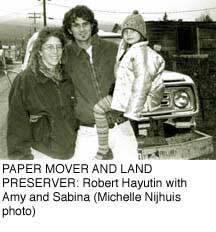 Robert, Amy, and their daughter Sabina have battled icy roads and mudslides during their many trips over McClure Pass, but they and their vintage truck have always brought the paper back in time to get it to your mailbox. This is the 30th year of publication for High Country News, an amazing feat for a small Western institution based in a small town of 1,500. But instead of one big bash to celebrate our survival and evolution, we've begun a series of get-togethers with readers in various towns and cities, as well as an occasional anniversary column to recount the newspaper's colorful, surprising and often tumultuous history. The photo at left is a case in point: Why is a High Country News editor in the early 1970s posing proudly with a very dead mountain goat? 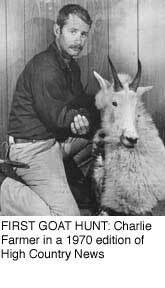 These days, we like to think the goat - preferably alive - symbolizes our journalistic approach, which is to report environmental issues sure-footedly, but without pomposity and with a large dose of humor. To find the answer, read Paul Larmer's story on page 20. One of this paper's core strengths is its readers. So we should not have been surprised, although we were, when a mention in a recent Dear Friends (12/20/99: Dear Friends) brought a call from subscriber Peggy Rawlins of Parachute, Colo. The Dear Friends item had said that "Radio High Country News," now on 11 stations, was in need of underwriting support, and Peggy called to offer some help. The environmental activist, organizer and arts advocate - whose current cause is the gas drilling that is occurring all over public and private land in Colorado and Wyoming - visited HCN's office, and spent most of the day with us. We learned that she's a Westerner who, one day, packed up her car and drove almost due east from California wine country until she hit Parachute, and there she stayed. 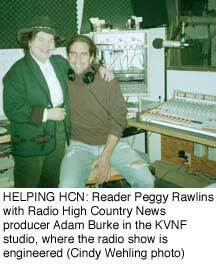 We are grateful for that move because, thanks to Peggy, not only is "Radio High Country News' well on its way to a new, in-house studio, but Peggy also agreed to help HCN's op-ed syndicate, Writers on the Range; the intern program; and www.hcn.org.